Are you considering purchasing a home on a lake in Alexandria or in a residential neighborhood? My advice is that you should start a conversation with a local REALTOR. Whether it is myself or a competitor at another real estate brokerage, you will have an advantage if you have a full-time and local REALTOR as a partner. One of the most valuable advantages is that you probably will learn of upcoming listings prior to a home being entered into Alexandria’s Multiple Listing Service. My office consistently is one of the most active listing offices in Alexandria and buyers working with myself or a partner can get in to visit a home first and prior to other buyers. There is no pressure if you contact me. My goal no matter how long it takes is to have someone be happy after they close on a purchase. Last year a couple I had been working with for over five years closed on the purchase of a Lake Carlos property. That may be a new record. 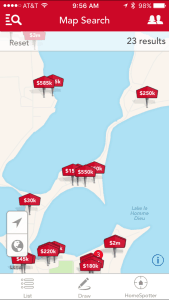 Buyers should also have a good mobile resource for real estate listings. Alexmn.com, is optimized for mobile devices and my Google Analytics data reports that nearly 50% of visitors to my site each day are using a phone or tablet. My iPhone and iPad are loaded with many real estate apps (Counselor Realty, Zillow, Trulia, Realtor.com and more) but I use my site when I am mobile and want to pull up listing info. The reason is that apps such as Zillow and Trulia are notorious for having errors and I prefer being able to focus quickly on a specific lake. On Zillow and Trulia I’ll often see listings that are no longer active or won’t find listings that are active and available for purchase. The pricing information is more accurate on Alexmn.com too as the backbone of my listing information is provided by the same Fargo company, FBS, that is the backbone of Alexandria’s MLS. A missing feature on the mobile version of my site is the capability to use GPS to show you listings based on your location. For that capability, you should apps such as those provide by Counselor Realty, Zillow and Trulia (text LAKE to 320-298-4446 to receive a link to the Counselor app). It has all the capabilities of the Zillow and Trulia app such as being able to filter search results by drawing on a map but also has accurate information.